A port city in the works for China. In this time and age, how does a more affluent country seek control of another less-developed but sovereign country, without so much as a squeak from the latter? Well, the affluent country can offer loans to the less-developed country to build lots of infrastructure, which the latter cannot afford or does not need. However, this infrastructure will not be profitable immediately, or may not profit fast enough for them to pay their debts to the affluent country. In fact, they may take more loans from the affluent country as they struggle to meet their debts. At this point, the affluent country may request favours and concessions from the developing country, to gain control of them. In this way, the affluent country can ask the debt-strapped countries to hand over the maritime port they have built for them, so that the affluent country can run it and profit from it, to offset the debt. The affluent country can go even further to turn the port into a military base for their navy vessels to take berth. For centuries, advanced economies have used various tactics – some geo-economic, some geo-political, some geo-military – to exploit weak and impoverished countries. Countries became targets for exploitation because they need money to develop their economies. More importantly, they have something that the hegemonic powers want. Over the last decade, China became the latest hegemonic powerhouse to exploit developing countries with its bag of tricks. In May 2018, Harvard University’s John F. Kennedy School of Government published an analysis report titled “Debtbook Diplomacy”, detailing how China is leveraging on its new-found economic influence to exploit 16 countries worldwide. These countries are Malaysia, Laos, Cambodia, Philippines, Myanmar, Thailand, Pakistan, Djibouti, Sri Lanka, Kenya, Tonga, Vanuatu, Papua New Guinea, Micronesia, Marshall Islands, and Palau. Six of these countries are in ASEAN. China has dished out billions of dollars of loans to these countries to build maritime ports, airports, highways, high-speed railways, residential and commercial properties, hydro-dams, oil refineries, and so on as part of China’s trillion-dollar Belt and Road Initiative (BRI). These countries lie along the 21st Century Maritime Silk Road in a roadmap laid out by BRI, spanning the South China Sea, the Indian Ocean, and the South Pacific Ocean, and stretching from Southeast Asia to North Africa. As these countries are struggling to repay the loans, China has been leveraging on their debt to achieve its strategic aims. Is this a good thing for the targeted countries? Sri Lanka is one such example. In 2007, the country needed money to revive its economy, which had been crippled by almost 25 years of civil war. The United States and Western nations withdrew support for Sri Lanka for its alleged human rights abuses during the civil war. Sri Lanka’s traditional ally, India, had taken a hard line against Sri Lanka after its ex-Prime Minister Rajiv Gandhi was assassinated by a member of the Tamil Tigers. As a result, Sri Lanka turned to China. Then-Prime Minister of Sri Lanka, Mahinda Rajapaksa, leased land to a Chinese state-owned consortium to build a deep-water container port in Hambantota, a little fishing town in southern Sri Lanka that is also PM Rajapaksa’s hometown. This was followed by a power plant, an airport, and a brand-new financial district called the Colombo Port City. From 2005 to 2017, Sri Lanka accumulated close to US$15 billion (S$20 billion) of Chinese loans. By the end of 2016, Sri Lanka’s external debt stock had soared to US$25.3 billion (S$33.8 billion), which amounted to 34 percent of the country’s gross domestic product. Of this, about 13 percent, or US$3.3 billion (S$4.4 billion) was owed to China. The Colombo Port City project, which is now called the Colombo International Financial Centre, was to have granted China 50 hectares of permanent, freehold land. Due to internal sovereignty and security concerns, the deal was brought down to a 99-year extendable lease rather than full Chinese ownership. 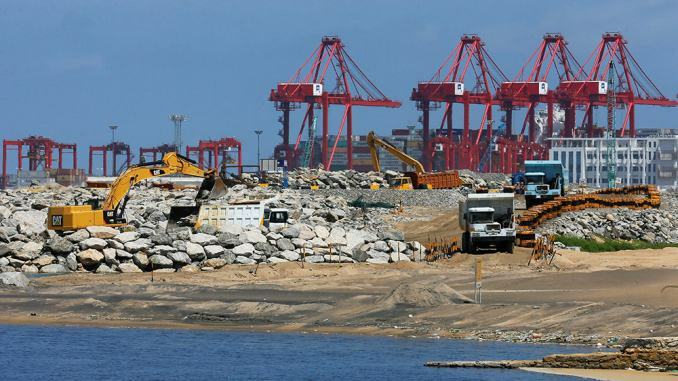 In December 2017, China started its US$1.12 billion (S$1.49 billion) 99-year lease on the Hambantota port as part of Sri Lanka’s debt-reduction deal with China, after Sri Lanka operated the port for seven years at a loss. China Merchants Port Holdings Group, with total assets of US$855 billion (S$1.14 trillion), will own a 70 percent stake in the port. This holding company is one of China’s largest and most powerful state-owned companies. It will effectively pay off the construction loans granted by the state-owned Export-Import Bank of China to the Sri Lankan government, in return for the 99-year operating lease. China is acquiring another 6,000 hectares of land near the port to build an industrial zone, which India fears might turned into a naval base for Chinese vessels. Many people in Sri Lanka today feel that their country has been sold to China. To China, the Hambantota port is key to China’s energy security as it is situated on the maritime route where oil is shipped from the Middle East to China every day. In May 2018, Sri Lanka took another US$1 billion (S$1.3 billion) loan from China to build an expressway between Colombo and the hill resort of Kandy. In May 2018, it also borrowed another US$1 billion (S$1.3 billion) from the China Development Bank to repay loans that are maturing in 2018. Sri Lanka is now trapped in a cycle of loans, debts, and more loans. In future articles in The Epoch Times, we will look at other countries, particularly Malaysia. Should We Be Concerned If China Is Extending Its Economic Influence? China today bears many of the hallmarks of a capitalist society. It has a state-led market economy that has produced many more billionaires than America, but also rampant economic inequality and corruption. One might believe that with China’s economic progress, China has put its dark communist past behind, and is now wholeheartedly embracing capitalism like any Western country. But this is far from reality. In its not-so distant era, China’s economy was almost brought to a standstill by its communist machinery, had it not been the death of party chief Mao Zedong in 1976. In 1975, China’s GDP per capita was US$178 (S$237), as compared to Singapore’s GDP per capita of US$2,559 (S$3,414) in the same year . Imminent economic collapse aside, the communism plague in China resulted in the democide (killings by government) of 38 million, most of whom were Chinese civilians. This figure was estimated by R. J. Rummel, a professor of political science at the University of Hawaii and author of 24 scholarly books on government democide. Contrast the 38 million deaths caused by the Chinese communist party to the 4 million Chinese killed by the Japanese in World War 2. Mao’s death opened China to market reforms under Deng Xiaoping, transforming China into the world’s largest economy by purchasing power parity. But China has never lost sight of its communism ideals. In commemoration of the 200th anniversary of Karl Marx, Xi said that the political theories of Karl Marx remain “totally correct”. Has China’s successful market economy been a means to furthering the communist party’s ideals? China has always phrased its state-led market economy as “socialism with Chinese characteristics”. This raises the prospect of whether China is creating the abundance of material wealth to advance itself into the later stages of communism, which were expounded by Karl Marx. With a one-party political system managing a country of 1.3 billion, one can never be too cautious.